Does Grizzly Adams have a beard? 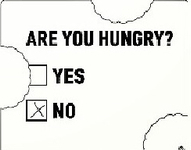 2 Responses to Are You Hungry? Think of the opportunities of cookies and other desserts lost by someone saying they were not hungry. I know Don Don’s, they are not words in the Y vocabulary.